With the rise of female UFC stars, Paige VanZant is one to watch. A star in the recently introduced Women's Strawweight division, she's looked strong in her early UFC fights. And now that there are Paige VanZant cards to chase, her spot in the hobby is likely to grow as well. 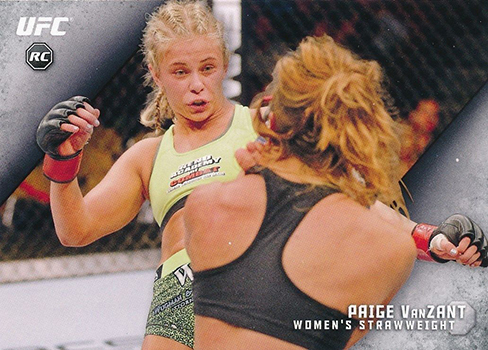 The Paige VanZant rookie card can be found in 2015 Topps UFC Knockout. It's actually the only set she's been in so far. Collectors will have to wait for her first autographs, which look to be coming in 2015 Topps UFC Champions. Collectors can also find several different custom-made Paige VanZant cards on the secondary market. As nice as some of these look, they are not licensed collectibles and are unlikely to have any long-term value. Besides trading cards, there is a growing amount of autographed Paige VanZant memorabilia out there. Like any piece of signed memorabilia, unless you get an autograph in person, the safest route is getting something that has been authenticated by a reputable company like PSA or JSA. VanZant made her UFC debut in November, 2014, scoring a TKO win versus Kailin Curran. She took home Fight of the Night honors in the process. VanZant, a former model, won a unanimous decision in her follow-up fight against Felice Herrig in April, 2015. Click on the links and images to shop for cards on eBay. If you're looking for the Paige VanZant rookie card, this is it. So far, it's also her only card. The horizontal card features a minimal design that emphasizes action. The shot was taken during her UFC debut, a fight against Kailin Curran. Besides the basic version of the card, it has four serial-numbered parallels: Silver (#/199), Gold (#/99), Red (#/8) and Mat (1/1). Besides the serial number on the front, the only other major difference is the color on the card corners.And in case you're hunting for the one-of-one Mat parallel, it has been found by a collector. She has no other inserts or autographs in the set.